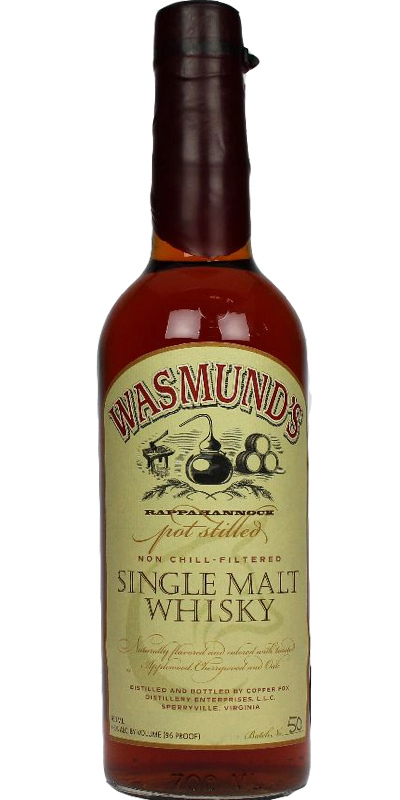 Wasmund's is a single malt whiskey that is distilled in the Copper Fox Distillery in Sperryville, Virginia. They do not use peat to dry their malt, but apple and cherry wood. The distillery fired up the stills in January 2005, under the ownership of Rick Wasmund, who gave his name to the whiskey (I wonder why it was not simply called Wasmund’s Distillery, but who am I?). He founded the distillery after having learned the craft at Bowmore on Islay. The nose is very special. Raw barley, apple sauce and honey on the one hand; umami, pine sap and wood shavings on the other. The whole is rather sweet as if some raisins and a pinch of cinnamon were put in the mashbill as well. I think it works. I find this special, but very pleasant indeed. It is quite hard to put the palate into words, to be honest. It has something fruity and sweet, but also something dirty like a wet paper. Leather! Again wood shavings. That wood becomes very, very loud, in fact. It is almost like I am licking the bark of a tree! And still – it works! Quite spicy. Besides the cinnamon, I also get some paprika and woodsmoke. Towards the end it even becomes somewhat smoky. I like this! The finish is long, warm, spicy and drying. Very grainy. Whole planks at the end. Some bitterness at the death. I am very happy with this. A lovely taste explosion that is hard to compare. A discovery. According to the bottle specification, the batch no. Matured for 42 months. Other batches had significantly shorter storage times of about one year. By using wood chips, the whiskey looks much longer stored. Here I had a deja-vu to an interesting experiment by whiskeybase member t.norad: 10-year-old Glenfarclas, ripened with hornbeam. The whole thing was touched in different ripening phases. Also here came eventually strong wood notes to bear. So too with the Wasmund's. Maybe a little too much of the good, because he sometimes acts a bit "over the top". Nevertheless: an interesting "exotic".